Manulla were crowned Mayo League masters division one champions on Wednesday night last with a comprehensive win over already relegated Snugboro. The win completed a league double for the Manulla 7’s and Masters sides. Straide and Foxford United follow Snugboro down to division two next season after being beaten by Kiltimagh-Knock United who finished the season in second place. Swinford and Ballyvary Blue Bombers opened the evening with an entertaining 3-3 draw which consolidated the Bombers' division one status for next year. Swinford were left to sweat for a few hours until Straide were beaten to find out their own fate. Paul Byrne, John Keane and Brian Regan hit the net for Swinford with Michael Reddington, Damian O’Reilly and Jimmy Byrne with the goals for Ballyvary. Manulla claimed the league title in the next game of the evening with a comprehensive 11-1 victory over Snugboro United. Having beaten Westport United last week many expected Manulla to claim the title and they duly delivered. With Snugboro having been already relegated it was expected to be a procession for the champions, but United made things difficult for Manulla in the early stages. But once Manulla scored the goals started rolling in. Dessie Campbell finished with a hat-trick, Paul Finn and James Cunningham scored two each and John Dempsey, Dermot McNicholas, Gerry Jennings and even goalkeeper Graham Glavey got in on the act. Piotr Slabik hit Snugboro’s goal. 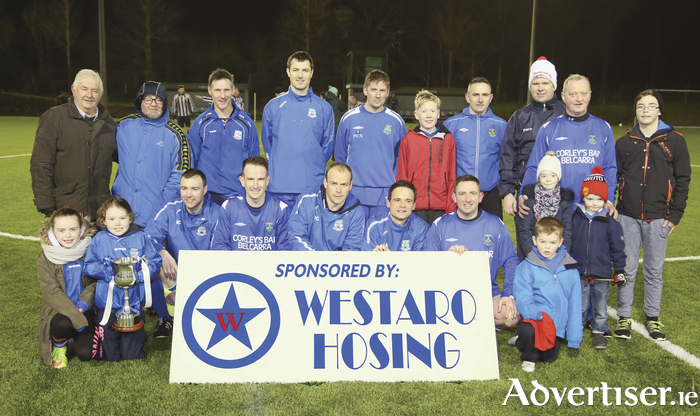 Westport United and Ballina Town played out an entertaining contest in what turned out to essentially be a cup warm-up clash for both sides. It was Westport who came out on top with a 3-2 win but they didn’t have things their own way throughout. Despite taking a 2-0 lead into the half-time break, United were caught by two quick goals from Clive Gilmartin to pull Ballina level before Gilmartin himself was handed a straight red card midway through the half, and Alan McLoughlin grabbed a late winner for last year’s champions who will head into the cup with high hopes of silverware. Kiltimagh-Knock United went into their final game against local rivals Straide and Foxford United knowing the league title was gone but that they could still end the league season on a high before the defense of their cup begins next week. Straide had it all to play for, however, as a win could keep them alive in division one, but it didn’t materialise with Kiltimagh coming out on top by 10-3. Straide did put in a battling performance but with only eight players available, and losing Pat Reid to injury in the first-half, it was always an uphill struggle. Andy Leadbetter hit six goals for Kiltimagh with Paul McDonagh (2 ), Danny Higgins and Gavin Groarke grabbing the others. Micheal Smyth and two Shane Conlon goals were mere consolation for Straide.